The blockbuster movie Terminator 2: Judgement Day was released in 1991. That was 25 years ago. Why that’s important is that even though T2 is like ancient history to many folks these days, there was a scene in the movie (at 1:25:20 to be exact) where the young John Connor and the T2 (Arnold Schwarzenegger) are digging around a weapons cache buried in the desert. There is a clear shot of the old Mountain House logo on a large box in the background just before the good Terminator discovers a Gattling Gun and delivers a priceless smirk to the camera. That particular Mountain House freeze dried food that I’m sure was real, would have just hit its “Best By” date today. That’s right, Mountain House freeze dried food has a recommended Mountain House freeze dried food since before T2 hit the big screen. 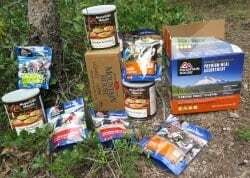 Some Mountain House freeze dried food today has a 30-year shelf life, but likely it’s way more than that. In fact that triple-decade number is more a “Taste Guarantee” than anything else. For details about determining the actual age and “best by” date of Mountain House freeze dried food can be found here. Mountain House answered the call to provide better-tasting longer-lasting military rations for Special Forces fighting in the Vietnam Conflict. They won the contract and the rest, as they say, is history. Back then Mountain House was known as Oregon Freeze Dry and moved into the consumer market in 1968, and thus Mountain House proper was born. Just south of Portland, Oregon is the town of Albany nestled in the Willamette Valley. That’s Will-am-it, not Will-a-met. Get that right and you will be almost golden. Pronounce it Or’-ah-gun and not Ore-E-gun, and you will be thought a native. Even better would be to drop an entire syllable making it “ore-gun” but that takes practice to avoid sounding confused. Similar to New Orleans truncated into Nor-leans. 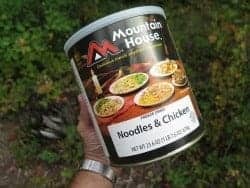 No matter how you pronounce it, Mountain House freeze dried food is made in Oregon and comes in foil packets that double as “food bags,” and #10 steel cans that are the most stable for long-term storage. Of the main factors that can affect food over the years, only temperature and time are the big ones. The other factors including humidity, light, oxygen level, and noisy critters are easy to address. Freeze drying is a simple process that combines Freezing and Drying. It is basically an energy intensive process where food is frozen solid and then placed in a heated vacuum where the water sublimates away. Sublimation is a process where a substance changes from a solid to a gas and essentially skipping the liquid phase. Dry ice is a popular example of sublimation where carbon dioxide goes from a solid to a gas. A common example of water doing the same thing is when wet clothes actually dry out even in sub-zero temperatures. Hang some wet mittens out on the line in the middle of winter. They will dry, but it will take a while and the temperature never has to rise above freezing. A highly primitive but effective form of freeze drying was practiced by Peruvian Incas as long ago as 1250 BCE. Attempts at modern freeze drying were worked on during World War I, and the first freeze dried coffee appeared in 1938. NASA raised the bar further ultimately creating what might be the first freeze dried food most of us tried: freeze dried ice cream. As I recall from my childhood, strawberry was the first one I tasted. In an nutshell, the freeze drying process removes 80% of the weight yet retains 98% of the nutritional value of the original food. And reversing the process is easy, just add water. The prefered method is to add a precise amount boiling water to the food, but in practice, you can be extraordinarily sloppy with your measurements and temperatures as long as your culinary expectations are somewhat forgiving. Freeze drying might be simple in its process, but modern freeze drying requires about twice the amount of energy as canning. That’s a far cry from when the Inca’s laid out potatoes and meat on stones at high elevations where the food froze overnight and then heated up in the morning sunshine evaporating off its water and becoming loosely frozen-then-dried. It seem little is immune these days from the freeze dryer. The list of foods for breakfast, lunch, dinner and dessert is astounding. Even more so is the fact that much of the nutritional content of freeze dried food is essentially unchanged. According to the Livestrong website. The issue with ascorbic acid, however, is an issue. Ascorbic acid is a form of vitamin C which is an important chemical that humans need and cannot produce on their own. As you all know, scurvy is a disease that results from a deficiency of vitamin C, and made famous by sailors and others who ventured away from land for extended periods of time. Luckily James Lind, a Royal Navy surgeon proved in 1753 that some simple citrus fruit would prevent scurvy. Case closed. But the jury is still out when it comes to protein activation in freeze dried food. Likely it’s a non-issue, but there are concerns about freeze drying medical products. Freeze drying does not eliminate ascorbic acid from fruit, but it does reduce it by a statistically measurable level. That does not mean that there is no ascorbic acid left behind, but rather the noted decrease is not random. 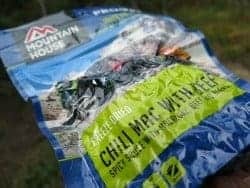 Mountain House freeze dried food comes in two main package options; pouches and cans. The pouches and Pro Pouches are single meals that can be eaten straight out of the package. The regular Mountain House freeze dried pouches have nitrogen gas in them that causes the pouch to expand and contract in size depending on elevation. The higher the altitude, the lower the ambient pressure meaning the internal pressure inside the pouch causes the package to bulge out like a balloon. 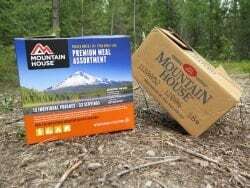 The Mountain House Pro Pouches are vacuum sealed meaning any extraneous gas is removed so the pouch volume is unchanged as the barometric pressure changes. And for those who might have forgotten their atmospheric chemistry, the nitrogen in the non-Pro Pouches is just nitrogen, and nitrogen, or N in chemical symbol, is 78% of the air we breathe every day so there are zero health effects from eating nitrogen, or breathing it. At the time of this writing, any new #10 cans of Mountain House freeze food will still taste great until the year 2047 or 30 years from now. A #10 tin can contains 110 ounces and is about the size of a coffee can because it is a coffee can. Tin cans got their start in France around 1810, but the USA didn’t jump on board with tin canning until about 1901 which was a good thing since some early canning methods introduced health hazards including sealing the lid with lead solder. The tin cans of today are marvels of storage. The metal, sealing methods and any can linings are specific to the contents of the can. And since Mountain House freeze dried food is nowhere near spicy salsa with extra jalapenos, so the very dry Mountain House contents don’t fight with the metal prison while serving its 30-year incarceration. Of course the cans do have a downside. A couple of them actually. First of all, they are large by mobile-standards. The volume of a #10 can is by definition fixed meaning it takes up the same amount of space whether empty or full, heavy or light, opened or not. Which leads to the second size issue: all or none. Once you open the can, the clock is ticking much faster on when the food will go bad. Just how fast is the clock ticking? About 1,500 times faster! Mountain House recommends consuming the contents of an opened #10 can within a week, and that includes resealing the can with the included plastic lid. A way to deal with the short life of an opened can is to either share the food and expect the same in return, or look for ways to supplement the canned food to limit its repetition as you consume a dozen meals in a row of Chicken Teriyaki. Stay tuned for part 2 where calories, food choices, cooking techniques, can breeching, and storage suggestions will be addressed.